We’d love your help. Let us know what’s wrong with this preview of Social Relationships by Joseph P. Forgas. Human beings are an intrinsically gregarious species - our personal relationships are of immense interest to us and are a key factor in achieving happiness and well being. From the moment of birth, humans crave love and intimacy and we devote much energy to creating and maintaining successful personal relationships throughout our personal and our working lives. However, mo Human beings are an intrinsically gregarious species - our personal relationships are of immense interest to us and are a key factor in achieving happiness and well being. From the moment of birth, humans crave love and intimacy and we devote much energy to creating and maintaining successful personal relationships throughout our personal and our working lives. However, modern industrialized societies present a particularly challenging environment for sustaining rewarding personal relationships. 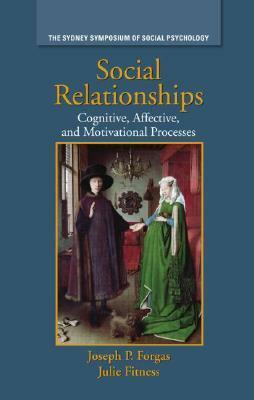 Understanding how people initiate, develop, maintain, and terminate relationships is one of the core issues in psychology, and the subject matter of this book. Contributors to this volume are all leading researchers in relationship science, and they seek here to explore and integrate the subtle influence that evolutionary, socio-cultural, and intra-psychic (cognitive, affective and motivational) variables play in relationship processes. In addition to discussing the latest advances in areas of relationship research, they also advocate an expanded theoretical approach that incorporates many of the insights gained from evolutionary psychology, social cognition, and research on affect and motivation. To ask other readers questions about Social Relationships, please sign up.